The Astrogeographical Position of Washington and past and future transits. Locational Astrology & History: transits of the outer planets in relation to the astrogeographical resonating degrees of the US governments are the topics I`m dealing with in this blog article. Astrogeographical position of Washington for morphogenetic field level 1 which descriebes the supraregional, global topics of resonance of the US capital and government: The astrogeographical longitude of the US capital Washington is located at 6° Cancer and it`s latitude at 27° Leo. These coordinates provide a highly relevant astrogeographical definition for international comparison of the role, situation and transits of the government of the USA. I`m currently working on a deeper study of the comparison of the astrogeographical resonance degrees of the 50 US State capitals in regard to their roles in the national morphic field, US and single state history. While I`m writing this article in summer of 2015 the highly problematic transits of the outer planets Neptune, Uranus, Pluto and Saturn that marked the first Obama presidency between May 2008 and March 2013 are over. That could provide the “hope” for a recovery of future US governments from the problems installed into the US` financial, political, ecological and human rights situation during the G.W. Bush presidency. But the experience with astrogeographical data is that the lack of tight tension from the outer planets opens up opportunities for the unhindered expansion of the ruling administration and the plundering of the ressources of the people through the lobbyists that influence and/or determine the government. That was the case not only during the 9/11 events but also during the second G. W. Bush presidency. The Total Solar Eclipse on 21 August 2017 will take place at 28°52`56″ Leo right next to the astrogeographical position of Washington of 27° Leo directly overshadowing the capital of the USA and with Uranus in Aries indicator for the populist and neofascist movement sweeping across our planet since the entry of Uranus into Aries in May 2010. Even the impact of the Saturn-Lilith conjunction at 21°Sagittarius the sign of direct profits and success by all means can be expected to be supportive of the changes brought about in the USA through the new neofascist Trump government. During a solar eclipse the Moon as indicator for the suppressed and unexpressed, subconscious, unborn, the darkness itself, pending and waiting spirits, unfelt emotions, inidviduals whose umbilical cords have not been cut overshadow the Sun and light. There is a long list of issues on the agenda that should be explored as potential topics to be dealt with by the stimulation of development through the energies set free by the eclipse. Target USA: The Unity of the USA is definitely in question and the secession of some states from the Union is a logical consequence to be called for even though I doubt that this will actually happen. The “Fort Sumter” transit of Neptune into the square position to the 6° Cancer coordinate of Washington in April 2025 will be the final test for the stability of the Union. Threats to the Union may be felt as negative – and they may well be – but the processes behind them are to be understood as constructive in order to solve the underlying issues and integrate new aspects of development. Target NATO: The splitting and as far as the russian side is concerned the abolition of NATO is a logical consequence and a central aim of the Trumputin collaboration. That may be felt as positive and in many ways it certainly is. But a for example Russian – American – British – Saudi Arab collaboration would be an even more powerful alliance than NATO has ever been. Such a military alliance between Russia and USA is clearly headed at the installation of a Russia – US controlled world government. Target EU – the largest economy in the world: The social networks propaganda machine built up by the US – Russian – British secrete services when operating together can be expected to manage to split up the largest economy in the world the EU through a mixture of tactical manoeuvres and direct military pressure on the East European States especially Ukraine, Baltic States, Poland, Belarus, Bulgaria, Hungary, Romania but as well on Germany and France. The first targets in Europe directly threatened through the Solar Eclipse position at 28° Leo are: Sofia (Bulgaria) located at 27° Taurus – 19° Scorpio, Talinn (Estnia) at 27° Scorpio – 13° Aries and Minsk (Belarus) at 26° Leo and 0° Capricorn. The eclipse position of Mars at 20°41` Leo falls in exact square to EU capital Brussels` astrogeographic position at 22° Scorpio – indicating a new direct attack on the European economy, currency, independece and all EU institutions with the clear aim to weaken or take over control over the EU. The August 2017 eclipse position of Chiron on 28° Pisces as the ruler of midheaven will be conjunct the position of the Central European solar eclipse of 20 March 2015 at 29° Pisces. Compare: Astrogeographical position of Berlin and Future Transits. Pseudo Target Islamism: Islamism is a US-Saudi created political instrument and not a plausible realistic common target of the Russia – USA alliance. It can be expected that islamism will be further bred in order to keep it alive as a propaganda target – the realistic function for which it has been created. Another plausible purpose islamism will be used for in the future is the control over Africa through destabilization. A side effect of the employment of islamism for that purpose is the pressure on the European democracies through migration. The next really tight planetary challenge for the US government will be Saturn`s transit over 6° Capricorn in opposition to Washington. The start of this process will be triggered through Saturn`s ingress into Capricorn the sign of reforms and stability on 20 December 2017 and end in December 2018. The transit stands for the legal challenge of the government and the conscious recapitulation of problems unsolved in the past. It is an ideal moment for all reforms and updates made to protect the stability of the American Constitution and the country as a whole. After that Saturn`s next transit in tension to Washington will also take place in opposition to the resonance degrees of the US government. It will be effective between May 2022 and March 2023 when Saturn passes 27° Aquarius in opposition to Washington`s astrogeographical latitude at 27° Leo. The simultaneous influence of Neptune who usually brings back the awareness of suppressed reality, contamination and destruction of purest natural resources could indicate the dramatic effects of climate change on top of all the political factors. The fracking gold rush “undermined” by the globalized neofascist lobbyism of the 2010s when Uranus passed Aries might come to a plausible and sudden end. 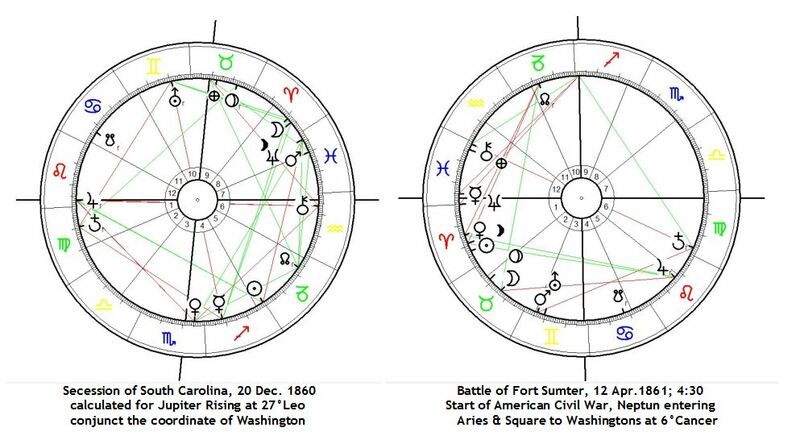 The “Fort Sumter Constellation” or “Secession Constellation” which repeats itself when Neptune enters into Aries triggering the square position to Washington`s 6°Cancer coordinate is due in April 2025 and will be effective until about April 2029. This will be the 2nd ever transit of Neptune over that position in the history of the USA and the first time since April 1861. Even if there was no new secession to be expected the emancipation of single states in the USA from the grip of the out of date majority voting system, the two-party sytem and the manipulative, commercialized US type of presidential elections may be stimulated during that period. The lack of tight aspects of tension from the outer planet marked the period between January 2004 and May 2008 providing opportunities for the unhindered plundering of the financial ressources of the american people by the Bush administration. It was only at the moment of Neptune`s transit through the last degrees of Aquarius and in straight opposition to Washington`s coordinate at 27° Leo since May 2008 when the disaster created by the Bush government became fully effective and the world economy went into one of its deepest self-organized crises in recent history. Neptune´s opposition transit was initial for the Obama presidency. It explains Obama´s status as representative of a minority and the difficult situation under which he took over responsibility for the problems created by his predecessor who had gone beyond all limitations in spending american money and the destabilization of control over the banking sector as well as the secret services. Neptune´s heavy challenge of Obama`s stand was effective until February 2012. Between January 2010 and December 2012 Pluto moving between 3° and 7° Capricorn passed in an extremely tight opposition to Washington`s coordinate at 6° Cancer. During the same period Uranus moved into the sensitive position at 0° Aries (compare attack on Fort Sumter) in May 2010 adding to the tension caused by Pluto until March 2013. And in addition to that Saturn`s transit into Libra between October 2009 and October 2010 made the year 2010 an intensely questioning phase for Washington. The development in this period also brought really fundamental progress and reforms within the USA. Among these are: The Patient Protection and Affordable Care Act (Obama Care) on 23 March 2010 and the retreat of troops from Irak before 16 December 2011. The start of the publication of data about illegal and criminal pratices of the US army and government institutions in nearly all countries of the world by Wikileaks since 2010 fell into that era. The grip of the secrete services on the government which did not allow democratic recapitulation of these practices by the government and democratic isntitutions fell in to that era too. Therefore the question has to be asked in how far these transits of Pluto and Saturn actually explain the forces that blocked the democratic institutions. Obama in the grip of the almighty weapon production lobbyists, wars, police state, radicalized republicans, hedge funds and unprecedented debt crisis created by the Bush administration and US capitalism (Saturn-Pluto): Alltogether it can be concluded that the effects of these transits worked by threatening and blocking the government And not only has the US state been financially ruined and the american people`s money been shifted into the hands of the supporters of the Bush conspiration but also has an extremely powerful group been created that now controls all the money taken from the USA`s financial ressources. The partial abolition of civil rights and thus the partial abolition of the american constitution introduced by the Bush government can also be seen as having become more and more effective, habitual and threatening during the era of Neptune, Pluto, Saturn and Uranus`s pressure on the degrees of resonance of Washington. This shows also the close relation of Saturn and Pluto conjunctions with totalitarian systems, ideologies and fascism which in the case of this period exerted its pressure on the government from within and not from outside of the country. The 2001 events during the presidency of George Bush junior fell into a phase when the outer planets Uranus, Neptune, Pluto and Saturn did not exert tight aspects to the position of the US government in Washington. Instead it was highly expansive Jupiter that was moving conjunct the position of the US government in Washington at the time of the attack on the WTC building and the Pentagon. The astrogeographical indication here is that the 9/11 events were being controlled by the government or government related institutions. The start of the G.W, Bush Presidency can consequently be interpreted as a phase characterized by the lack of problematic transits and a time of unhindered expansion (Jupiter conjunct Washington) and even voluntary creation of problematic issues until 2002. This also means that the problematic transits of the outer planets in relation to the astrogeographical positions of governments are not necessarily negative or actual problems but in fact regulative factors and stimulators of solutions. The serious misunderstanding in predictional astrology often is that the “problematic transits” are mistaken for the problematic issues. The first problematic transit during the George W. Bush presidency was the transit of Uranus in opposition to the astrogeographical 27° Leo position of Washington between January 2002 and January 2004 which brought the illegitimate attack on Iraq on 19 March 2003 a country which in no way had been involved in the Nine Eleven event. This war represented Uranus`s opposition to Washington and as such an attack on the autonomy, integrity and authority of future US governments. 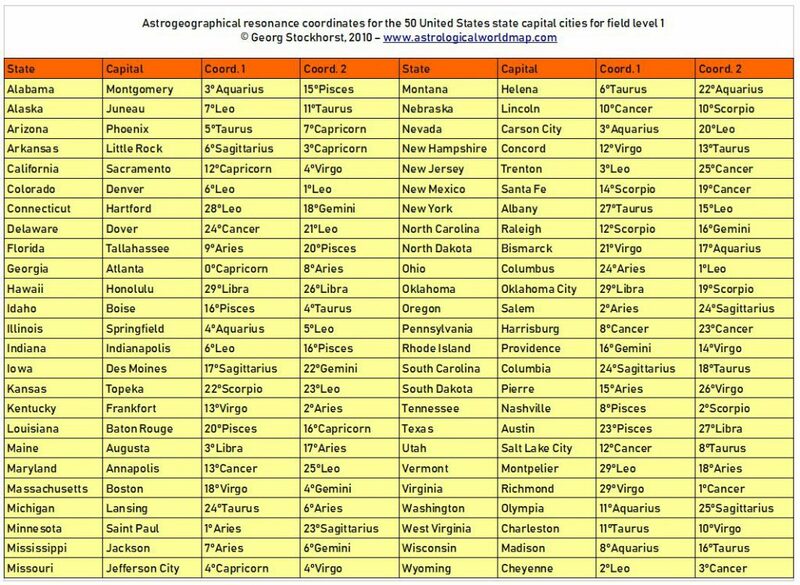 In the Foundation Chart of the USA Venus was conjunct Jupiter on the astrogeographic position of Washington (6° CAN) – 14 years before the decision was made to built the new capital!!! In the hypothetical Sibley Chart for the foundation of the USA the astrogeographic position at 6° Cancer was occupied by a conjunction of Jupiter at 6° with Venus at 3° Cancer. The second astrogeographical coordinate at 27° Leo was challenged through the exact opposition of the Moon at 27° Aquarius, This aspect can be interpreted in 2 directions: in regard to the construction site it describes the extreme changes that the area at the mouth of the Potomac River went through in the course of the construction of the new capital. In regard to the intense appeal for personal freedom, emancipation, self-finding and liberation from slavery the site of the new government indicates the preference of a centralistic, self-centered, aristocratic, royal self-image which directly contradicts the visionary ideal of liberalism in Aquarius. 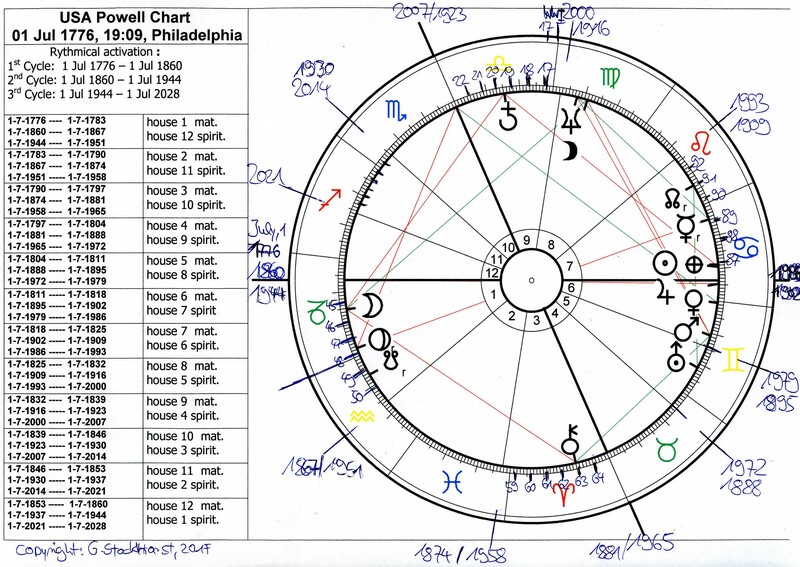 USA Natal Chart 1: the so called Powell Chart (with dates of rythmical activations for the first thre 84-year cycles) calculated for the first vote about the Declaration of Independence on 1 July 1776 calculated for 19:09 in Philadelphia as proposed by american astrologer Gary Lorentzen. On 1st and 2nd of July 1776 the USA was founded through the Declaration of Independence. 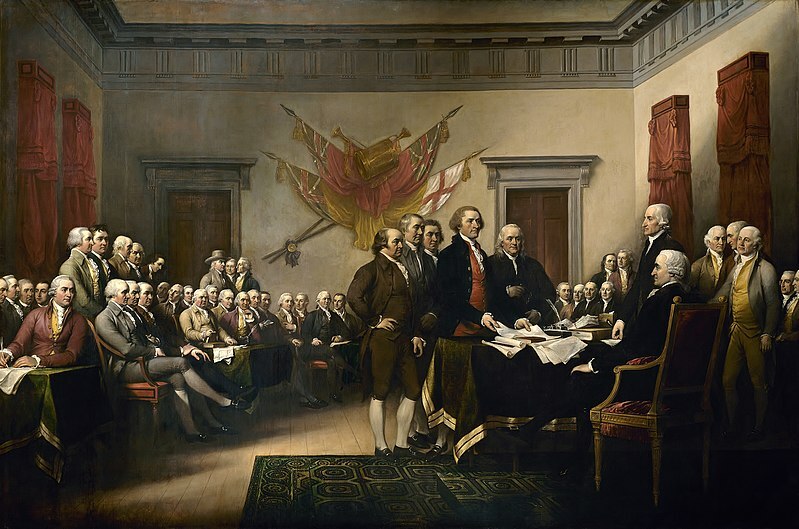 Later the 4th of July was settled as the date for the Independence Day. 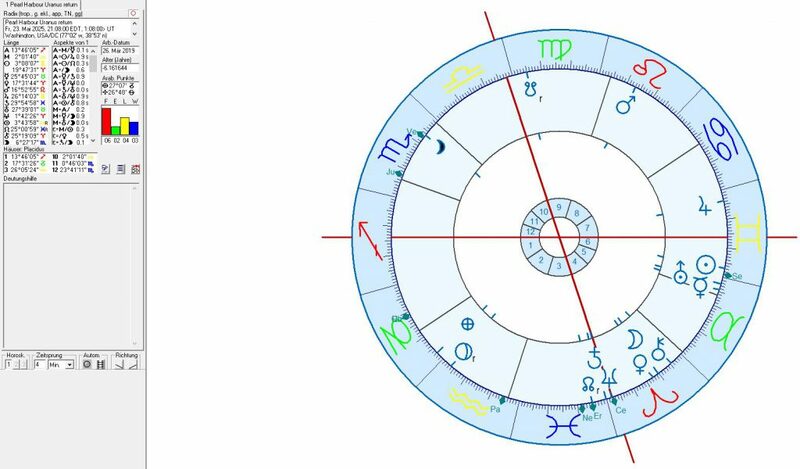 Between 1st and 4th of July the astrogeographic position of Washington at 6° Cancer was occupied by an intensely beneficial, luxurious, growth orientated, economically promising conjunction of Jupiter at 5°-6° Cancer with Venus at 0°-3° Cancer and the Sun between 10° and 13°Cancer. This “harmonic resonance” identifies the Washington area as a highly auspiscious site for the issues of the declaration of independence, the country`s political stability and it`s economical growth. A critical review of the constellation should not fail to recognize that Venus` unhindered expansion as the ruler of possession of land, economical ressources and financial income when stimulated through ruthless Jupiter the planet of success, personal advantages and victory at any costs couls appear as an aspect that allowed the suppression of humanistic concerns, spiritual identity and self-regulation. All the four personal planets from the Declaration of Independece in Cancer emphasize the situation of birth, pregnancy, fertility, motherhood, feeling at home and emotional independence and authenticity. The question may arise how we should understand the fact that human intuition unconsciously connects to the morphogentic patterns that underlie the landscape. I want to remind everbody at this point that astrology just like mathematics, physics and all other sciences assumes this pattern of perfect harmonious logical gravitation to hold all single parts of creation together and so provide nature`s patterns for orientation where human perception cannot even think of it. I`m not saying that the speculations about illuminated spiritual guides and highly educated architects building the US capital is all wrong. But don´t forget that this perfect harmony of humans with the morphogenetic field structures is given (to the positive or the negative) everywhere at any time and in all cultures on this planet. In a way it is nothing surprising and not even anything special that can be observed here except that it is always exciting to face the sublime nature of gods creation. 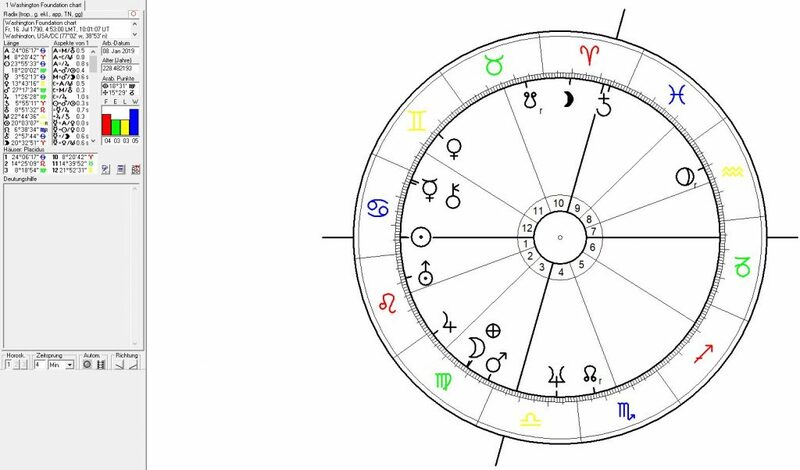 The Astrological Sunrise Chart for the foundation of Washington through the Residence Act signed into law by President George Washington on July 16, 1790 is calculated for sunrise with equal house system. Mercury at 4°and Chiron at 3° Cancer the rulers of the two Mercury signs Gemini and Virgo were not yet conjunct but moving towards the astrogeographical position of the central government area at 6° Cancer on that day. Their conjunction stands for intense planning, gardening, preservation and self-protection (Chiron as the ruler of Virgo) and hyperactive communication, building roads, bridges and networks (Mercury as the ruler of Gemini). Saturn at 5°in highly alert, active, male fire sign Aries the sign of action, speed, warfare occupied an exact square position to Washington explaining the foundation of the new capital as an intense challenge to the Washington area including fundamental changes of atmosphere. Saturn in Aries giving the indication of the start of a new era that included fortifying the town and taking care of the construction of a military base here. The first Pluto return after 247 history of the USA will take place between 2022 and 2023. That means if Pluto in the natal charts stands for the habitual patterns of experience and perception that the Americas of the modern era are based on – these patterns are: unrooted and unhindered occupation, exploitation, destruction and pollution of indigenous cultures and of the land provided by mother earth through the castes of european refugees who rule over the Americas since that era. The burning of the Amazone forrests and the pollution of all ancient ground water through Fracking are truly ultimate aims of that post-european caste mentality. And yes in a land of the free and brave – the aspect of hierarchy and trauma (Pluto) that the caste system and rulers of society (Pluto in Capricorn) rely on are the freedom to pollute and destroy and courage to lie and corrupt. That is Pluto`s inheritance in Capricorn. The american Pluto at 28° Capricorn falls exactly on the astrogeographic position of London – which reflects that the majority vote and 2 party system along with the english national culture and language, unhindered colonialism and capitalism of the British Empire in the late 18th century aret the historical basis for the US version of the american Pluto. 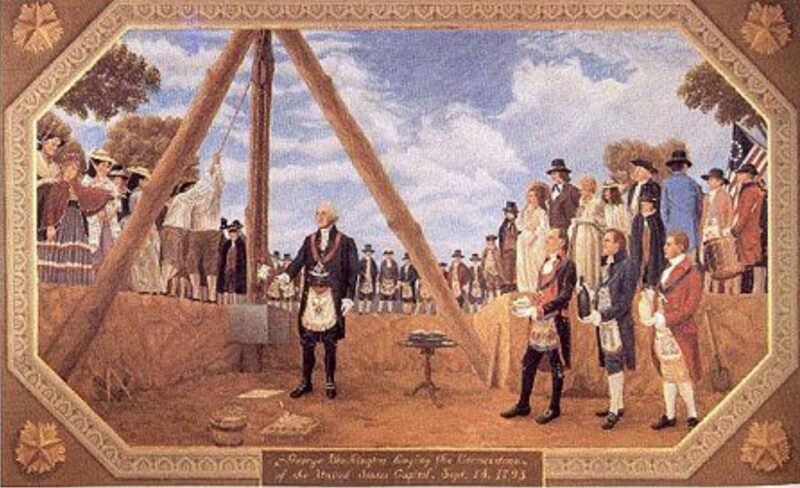 Jupiter at 7°45 Cancer was conjunct the astrogeographical position of Washington at 6° Cancer on the day it became the capital of the USA on 11 June 1800. Because of Jupiter`s expansionary effects this aspect clearly describes the expansion of the importance of the the government area in Washington from that moment. And Cancer also explains the intense emotional projections for example as a “capital home of the free and brave” as the Moon as the ruler of Cancer was in Aquarius the sign of freedom, rebellion, self-finding, emancipation and liberation on that day. The position at 6° Cancer falls in conjunction with the positions of Berlin at 10° and Moscow at 12° Cancer. Especially the conjunction with Moscow can be evaluated as an extremely important and stabilizing factor which might even have prevented much worse controversies since the beginning of the Cold War between US capitalism and Russia in 1917. As far as the transits of the outer planets are concerned their effects regularly stimulate the position of the US capital between 1 and 4 years before transiting the maximum of any aspects with the capital of Russia. But for the “inner” planets the time in between the maximum effect of transits for Washington and Moscow is only 6 days for the Sun, Venus and Mercury and only 12 hours for the Moon. As far as Berlin is concerned the conjunction between Washington and Berlin can be seen as extremely positive for the City of Berlin particularly regarding the US role after World War 2 with the Air Lift (1948/49) during the Berlin Blockade and the support for West Berlin until 1989. The Black Thursday events came at the climax of Uranus transit in a square to Washington`s astrogeographical coordinate at 6° Cancer on 24 October 1929. The “Black Thursday” which was the beginning of the Wall Street Crash leading to the worldwide Great Depression with most drastical effects in the USA and other countries worldwide. Venus the ruler of Taurus and planet of wealth, food, stability and roots was a at 6° Libra in exact square to the astrogeographical coordinate of Washington. The square position of Uranus meant a challenging of the US governments` economic and social politics and through it`s worldwide effects introduced the role of a global capital to Washington. Countries so far away from each other as Chile, Canada, Australia and Italy were among the countries hit most hardly by the recession. This Uranus square transition acros 6° Aries took place between March 1928 and March 1930. American Civil War: Jupiter`s exact transit over 27° Leo conjunct the position of the government in Washington in 1860 brought the Secession of South Carolina. Jupiter`s position indicates that in some regards (or say effectively) this act was in fact strengthening and not only weakening the position of Washington. But at the same time through the Sun`s entry into Capricorn it`s opposition to Washington`s 6° Cancer triggered extreme tension for the capital city. And even more so because the Moon passed in a square position to Washington while transiting the first decade of Aries. The beginning of the war with the Battle of Fort Sumter occured while Neptune was entering into Aries thus activating the square position to Washington`s astrogeographic coordinate at 6° Cancer which was active all the way throughout American Civil War. 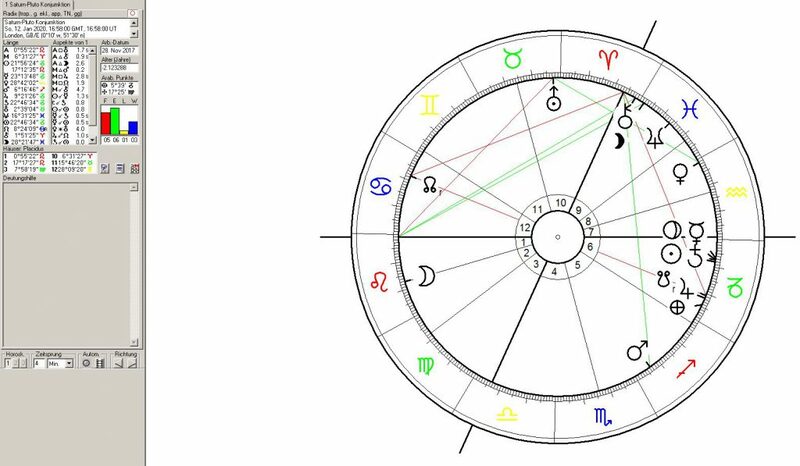 The astrological chart for the end of the American Civil War shows such clear transits to the position of Washington that it is almost an archetypal chart for various chains of interpretation (and meaning) of astrological transits of astrogeographic positions in mundane astrology. As seen in the chart for the attack on Fort Sumter the transit of Neptune into Aries and thus into a square position to the astrogeographic coordinates of Washington had been the most important astrological factor challenging the capital`s position. On the day of the General Lee`s capitulation the Moon was moving in Libra the sign of peace, ceasefires, negotiations in opposition to that Neptune. Neptune`s challenging aspect of the capital´s position was contradicted on that day by the opposition of the Moon and the square of Mars who was moving directly on the coordinate of the capital at 5° Cancer. But only 5 days later on 14 April 1965 the challenging effect of Neptune prooved to be still active when President Abraham Lincoln was assassinated. 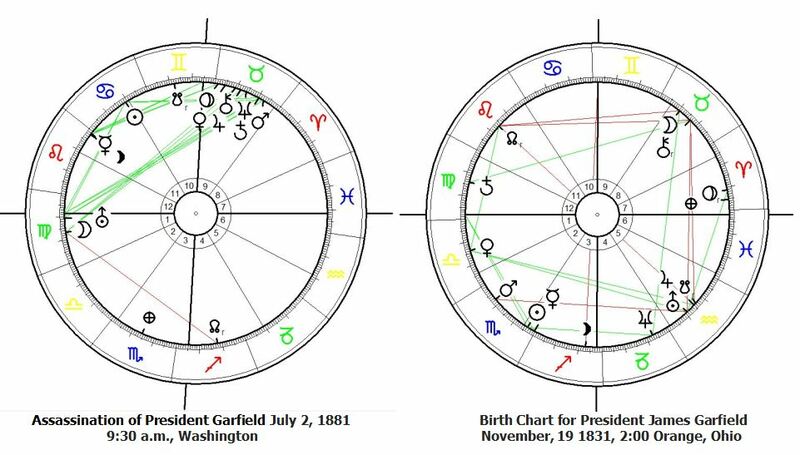 The assassination of President James Garfield on 2 July 1881, 2:00 in Washington happened under the extremely tight square aspect for the US government positions in the form of a Pluto (28°46`Taurus) Venus (25°33`Taurus) conjunction with its midpoint at 27°10`Taurus. Venus role as the ruler of Taurus is a strong indication of purely financial motifs behind the murder. Pluto in Taurus the sign of money, markets, possession of land and control over territories and wealth stood for a period of intense challenge to the government by dominant economical lobbyists. 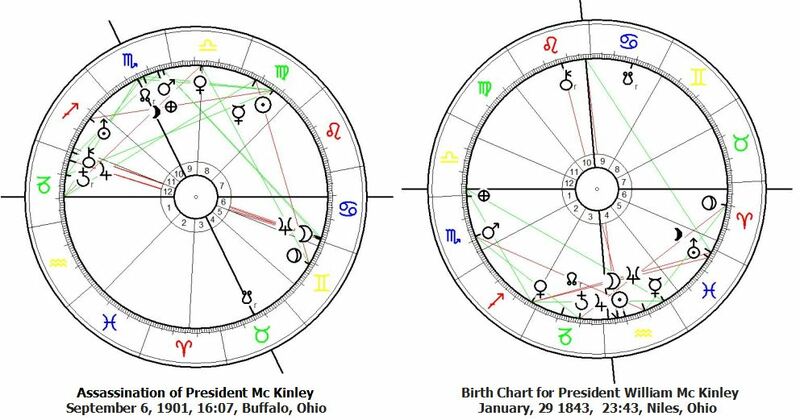 The assassination of President William Mc Kinley on 16 September 1901 at 16:07 in Buffalo, Ohio took place with a conjunction of Saturn (9°50`Capricorn) and Jupiter (3°18`Capricorn) with the midpoint at 6°34`Capricorn in exact opposition to the astrogeographical coordinate of the federal government area. 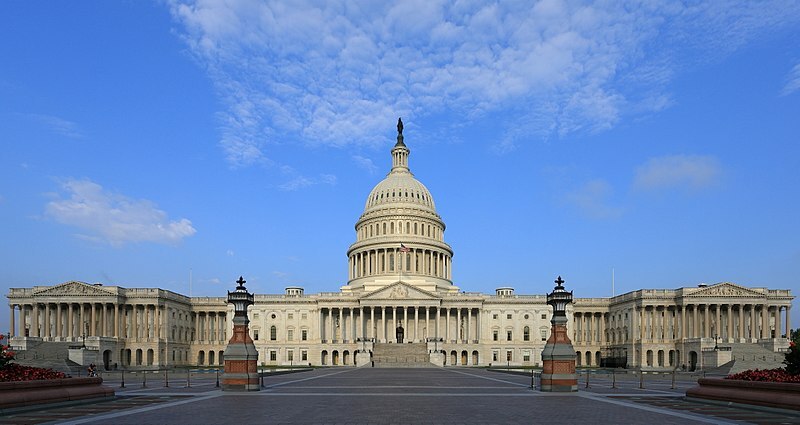 This opposition indcates not only an intense threatening of the position of the government by political opponents but also a critical examination of the corruption of the government by the legal and institutionalized opposition through Capricorns role as the sign of government institutions and administration. The Moon`s transit over Neptune in the moment of the assassination emphasizes Neptune`s role in the event. Alltogether Neptune`s transit into Cancer and onto the astrogeographical position of the federal government stands for a period of corruption and intense questioning of the role of the federal government. 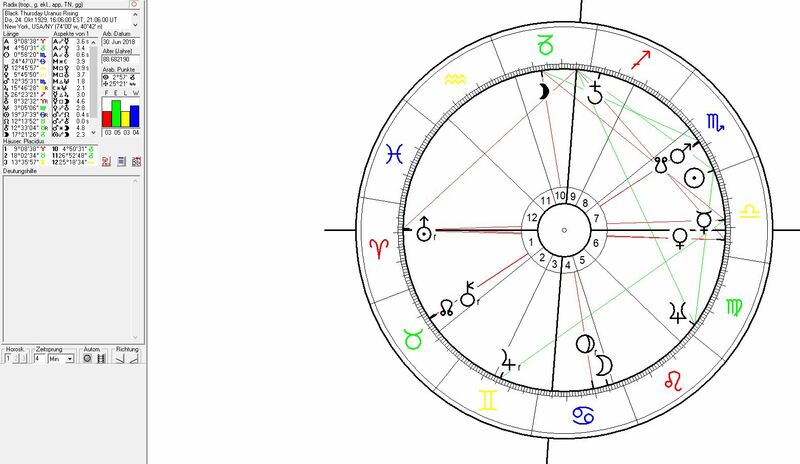 The astrological chart for the Japanese attack on Pearl Harbour reveals the intense resonance of the tranits of the outer planets with the astrogeographic coordinates of the United States` capital Washington. Uranus at 28° and Saturn at 23° Taurus were transiting the square position to Washington at 27° Leo. The intense threat to the territorial integrity of the country may lie in the fact that the “planetary attack” on the Washington position came from Taurus the sign of possession of territory bringing the first and only ever attack by another country`s army on the territory of the USA. The Cuban Missile Crisis between 14 and 28 October 1962 was the climax of confontation between Russia and the USA during the Cold War. The absence of transits of tension from the outer planets is surprising and even spectacular here. The only 2 highly problematic transits in regard to the astrogeographic positions of the US government were Venus in exact square between 26° and 27°Scorpio and Mercury also in exact square from 6°Libra although the incidents represented the most severe threat ever imposted on the USA by russian nuclear missiles. On 14th of October 1962 the day that the russian missiles on Cuba were detected the Sun at 20° Libra was in exact transit over the 20° Libra ascendant in the birth chart of John F. Kennedy indicating something like a wake-up call for the new yearly solar cycle of the President. Alltogether the transits do not explain the full dimension of the actual danger and enormous threat caused by the Cuban Missile Crisis. Particularly Mercury in Libra would rather explain the situation as an attempt to gamble with the unexperienced and comparatively young US president. Furthermore Venus`s square from Scorpio can be interpreted as an attempt to conquer not only territory but also expect financial gains through Khrushchev`s “manouevre”. Nikita Khruschev`s birth chart reveals the positon of the Moon at 27° Leo exactly on the degree of the government area in Washington, indicating his tendency of developing a self-image as a kind of “US President”. It can therefore not be excluded that the Khruschev`s Cuban Missile “move” was done out of personal motifs and even as an attempt to demonstrate his personal power to the american people. As Venus represents the ruler and significator of Libra Venus`s transit in a square to Washington may be seen as a threat focused to some extent on the personality of President Kennedy himself. Plausible speculations to be examined in regard to this constellation should include in how far the russian side did not take Kennedy serious or even expected him to withdraw and not confront the russian aggression indicated through the transit of Venus. Also for the day of the assassination of John F. Kennedy the absence of intense problematic aspects of the outer planets or even Mars for the position of the US government is spectacular. Bringing up all kinds of questions and speculations in regard to the occultism that has been created around the death of this President. The only remarkable transit is the Sun (29°44` SCO) – Lilith (24°11`SCO) conjunction with the midpoint on 26°58`Scorpio in an exact square to the position of the US federal government. Lilith is of course a clear indicator for the hidden circumstances and real motifs of the murder. A comparatively clear indication of the groups involved can be taken from the meaning of the degrees in the last degrees in Scorpio the sign of the “robber castes” which definitely point at influential lobbyists, highly ranked representatives of defense administration and superich conspirators such as large companies or Mafia – like organisations. The fact that the Sun is the ruling planet of the coordinate in Leo could explain the role of the Sun as an indication for competing actors in Washington behind the attack on the US president, government, constitution and politcal institutions. The North Node indicator of aim and/or decisive circumstance was at 12°Cancer exactly conjunct the astrogeographical resonance degree of Moscow. 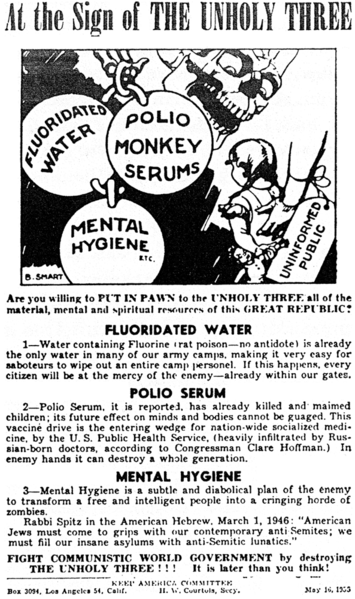 At the Sign of the UNHOLY THREE”, a flier first issued in 1955 to promote mental hygiene as a communist goal to destroy the U.S.A. The transit of Pluto over the 27°Leo resonance degree of Washington had its climax between December 1953 July 1957. More extreme but symptomatic historical events under Pluto conjunctions were the “Reign of Terror” after the French Revolution, the 1st Hitler Coup d`Ètat of 1923 in the Weimar Republic and the climax of the success of the Islamic State in Iraq between 2012-15. The decision for the US entry into Vietnam War was based on manipulation of information through the US secrete services namely the NSA. 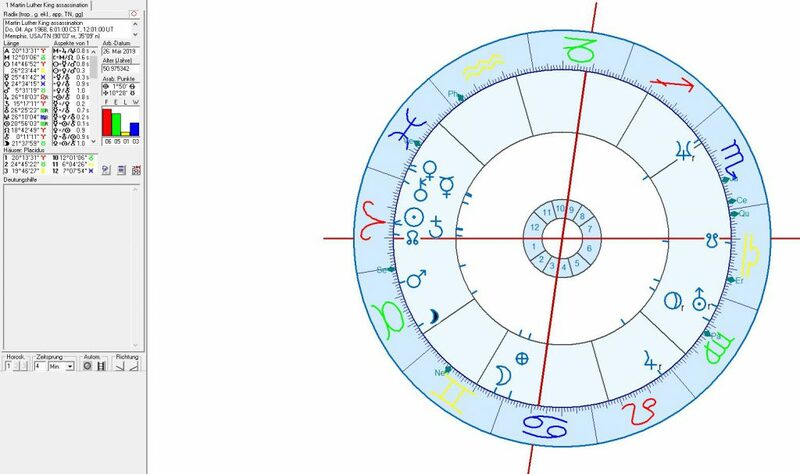 The astrological chart above shows that there was no tension from transits of the outer planets threatening the position of the US government at this time. Unthreatened Mars later on that day joined by Venus and the Moon was in transit over Washington indicating financial gains and similar motifs for this war. In regard to the astrogeographical constellations the beginning of the Vietnam war displays a similar quality as those of the Twin Tower incident in 2001. The climax of the square transit of Neptune over the 27° Scorpio position between January 1968 (25°Sco) and November 1970 (0°Sag) and the square position to Washington made that era one of the most traumatic in US history. 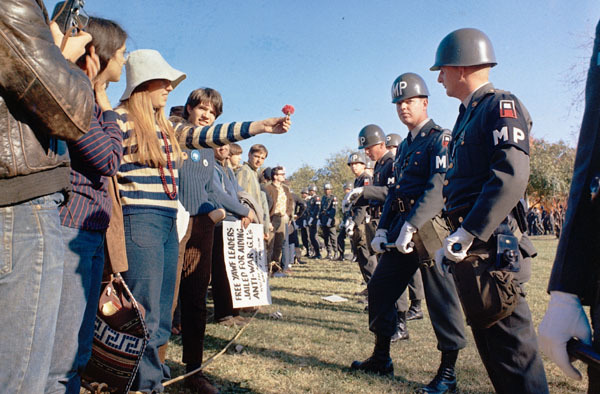 Neptune stood for the spiritual challenge through the hippie generation including the drug experience and the cultural revolution that it brought, the students protests but also the assassination of Martin Luther King and the destruction and contamination of the positive outlook on the role of the USA in World history through the US performance in the Vietnam War. Challenges through Neptune as the planet of spirituality may turn out as processes of reconnection, self-healing, self-finding in the long run. But like in the case of any other planet development through Neptune transits has to be grounded in the experience of humans through things deeply felt, insecurity and concern endured, confusion sorted out and stimulation of reconnection with the supreme, subtle, invisible and spirituality itself through real life lessons, pains, depression and transformation lived. From one angle of interpretation the square transit of Neptune makes the assassination of Martin Luther King appear as an act directed against the US constitution, the union and the government of the USA. But because Jupiter occupied the conjunction degree with Washington at 26°Leo at the same time the assissination appears to have been organized from Washington at the same time. The opposite was the case on the day of the “Capitulation of Saigon” which fell into the period of Pluto`s square transition to the 6°Cancer position of Washington between November 1972 (3°Libra) and August 1976 (10°Libra). On the day of the capitulation of Saigon on 30 April 1975 Pluto at 7° Libra had been moving in intensly tight aspects of tension to Washington for over 2 years. Saturn at 12°Cancer was conjunct the 12°Cancer astrogeographical resonance degree of Moscow the most important supplier of weapons for the North Vietnamese armies.